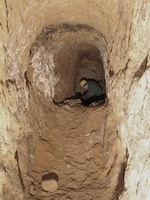 (1) Bronze age pits near the surface; nearby (2) are 18th century surface workings. (3) 18th century workings running up to shallow depth and (4) a shaft (now called Norweb Shaft after it was rediscovered by Norweb contractors laying a cable. (5) The 18th century adit leading to contemporary passages (6) along the fault/vein, some of which rise up to touch the bottom of the Bronze Age workings (3). (7) The 19th century Hough Level (which may have been called Oakes' Level) that undercuts and drains the older workings. Larger stopes (8) lie parallel to the Hough Level and a flooded sump in the floor (9) leads to unexplored workings. The entrance is a narrow cutting in the dell which leads up to a metal door. Before being rediscovered by the DCC, the entrance was completely lost and the adit was nearly full of leaf mould and water. 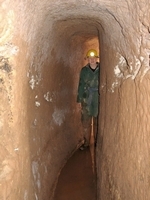 Inside, the passage is narrow and low with curved walls, wider at the shoulders, which give it the name of "Coffin Level". After a few hundred feet, the passage meets the Brynlow fault and turns right into the main workings. Where the passage turns right, a branch continues straight on but half the size of the entrance passage. This ends at a blank wall. In the main workings, there are six levels from close to the road in Artists Lane to below water level, a vertical range of some 100 feet. These are connected by a sloping shaft and some climbing ways, one with the ladder still in place. 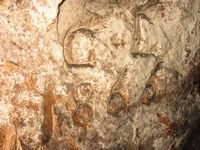 Below adit level, the mine was excavated in the 19th century . 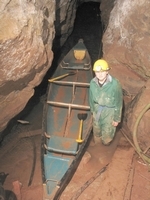 Except for some flooded workings, the lowest level in the mine forms part of the Hough Level and, since the DCC have worked in the area, access has been made possible again to Wood Mine to the west and Engine Vein to the east. From Brynlow, the Hough Level runs westwards along the fault for some distance before turning north and then east to enter Wood Mine. In the other direction, the level turns north as it leaves Brynlow and heads straight for Bear Pit and Engine Vein. 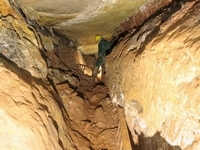 Because of the nature of the workings, Brynlow is not suitable for trips except by experienced cavers and mine explorers. For access, contact the DCC. The only entrance to Brynlow is the adit entrance. 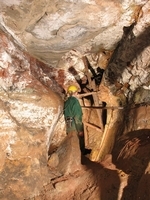 Go to the main photo gallery for more pictures of Brynlow Mine.